Songs We Love: Yola Carter, 'Fly Away' : The Record Carter got her start in the U.K. electronic scene singing for the Bugz In The Attic and Massive Attack, but her first love was always Dolly Parton. "If people are saying, 'This is fresh,' I'm like, 'Well, it shouldn't be.' [Laughs.] I would've killed to hear this," Yola Carter says. 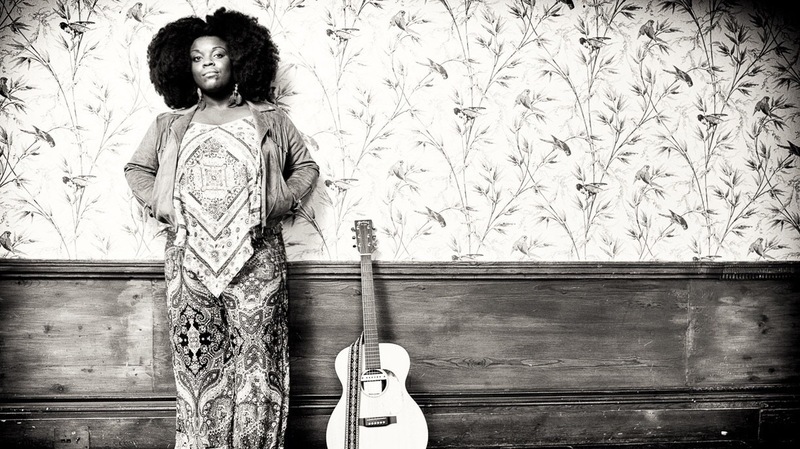 Few in the roots scene had heard of Yola Carter before she made her first appearance at Nashville's Americana Fest in September, which might've suggested that she was some sort of musical rookie. In fact, the 33-year-old black, British singer-songwriter is a seasoned studio and stage pro. She's acutely aware, though, that her musical background might be illegible to many Americana types, given that she spent a dozen years amassing credits under her given name, Yolanda Quartey, as a lyric and melody writer, arranger and featured gospel-soul diva in the world of U.K. electronic and pop acts like Bugz In The Attic, Massive Attack and Will Young. Long before that, Carter was a fiddle-playing kid growing up in a small seaside town in the southwest corner of the U.K., enthralled with Dolly Parton's autobiographical Appalachian tales, then a young adult treating the O Brother, Where Art Thou soundtrack and The Byrds' Sweethearts of the Rodeo as gateways into exploring everything from old-time music to longhaired country-rock. Her sights were set on making hippified, down-home music of her own, but like many a musician before her, she elected to take all the paying gigs she could in the meantime, fashioning herself into a far more skillful singer and song-crafter in the process. "Fly Away," a magnetic, fiddle-powered mountain rocker that appears on Carter's solo debut Orphan Country, showcases the striking results. She delivers its deftly austere melody in a keening, needle-pointed timbre, her phrasing both vigorous and full of finesse, registering a desperate determination to escape emotional suffocation. Late in the track, she works her way up to a feverish vamp against her electrified string band accompaniment. Over sandwiches at an East Nashville deli, Carter described what it's like perpetually being expected to explain how her professional history, not to mention her racial and regional identities, square with her choice of music. When I saw you play during Americana Fest, you alluded to your background — the fact that you grew up as one of the few people of color in your town, and stuck out even more because of your interest in country music. How did you respond to the context you were living in? Yola Carter: Certainly when I was growing up, it was just a battle of trying to explain yourself. That doesn't really end, don't get me wrong. There's something wonderfully unforgiving about the level of excess explanation. Every time you walk into a store, you've gotta be smiling and very purposeful with your movements, so no one thinks that you're lifting anything. Everything that my mom and dad had went into making sure that we were in a good area, so that we wouldn't get unnecessary levels of trouble. Probably most importantly, they wanted us to be able to play in the streets. So that was kind of their [thought] process on choosing to live there. I don't think they banked on the rest of it exactly. That kind of didn't pan out, that whole relationship. So it was very much broken home and broken town, which is often what country's about for sure. For anyone that's not really got a safe place or a natural sense of freedom and unconditional love and support, you turn to any source of expression, something that tells you that the world's different. TV doesn't always deliver on the kind of story you want, especially if you're a black girl in the U.K.
You're not likely to see any representation of your experience. No. Baby of color, that story didn't [get told], certainly not when I was growing up. So music kind of reaches out to you. I always think of us [people of African descent] as the Diaspora, plucked from not obscurity, but home, and placed into obscurity in various places. But all from a common root. People say, "What's your connection with American roots music?" I'm like, "My actual roots." [Laughs.] How about that, kids? How about my actual, real actual roots? How free did you feel to pursue your interest in country-leaning music? I thought, "I love Dolly." But the message we got in the U.K. of what you could do was so limited and segregated. I thought that with people like Eminem doing hip-hop the door would swing open the other way, but no, it didn't. I was just reading a new book called Just Around Midnight: Rock and Roll and the Racial Imagination. The chapter about Bob Dylan and Sam Cooke talks about double standards — how a white musician like Dylan was credited with innovation and originality when he took stylistic left turns, while Cooke, when he moved from singing gospel to crooning pop and soul, was, and still is, talked about as abandoning authentic black expression. How does that strike you? That story connects with my experience, for sure. Because I love the broad umbrella of American music, from folk and roots to blues and rock 'n' roll and gospel. But that whole kind of, "This is what you're supposed to be" — that mantra never really let up. You're [asked], "What do you do — soul/R&B?" I'm like, "Is this a question, if you've already answered it?" What aspects of Dolly Parton's work really spoke to you? My relationship with Dolly was a very early relationship. It was my mom's record collection. She had some compilations of all sorts of things. I was just listening to things like "Coat of Many Colors," so, really traditional country stuff. And it spoke to me because of the storytelling element, that idea of being able to put out your point of view. I really was story-obsessed. Always used to write stories. I started writing almost like autobiographical poetry, very much hinting at songwriting. Her delivery, like what she did with her trills, were really natural to me. It was more like I would sing everything, and that would just ring in my mouth in a really correct way. Physically, I was drawn to it, almost as though I was born into that. That made sense to me. And the fact that she was a woman. Can I have a feminist five minutes? I was looking for female role models, people that were doing stuff. From age four I knew I was gonna be a singer-songwriter. I knew it. But I was banned by my mother from having anything to do with the music industry. So I had to very much toe the line. That sense of struggle that Dolly [had], she's just very honest and very openly vulnerable. I found that really engaging, and it made me love her as a person — her frankness. As a young kid, I probably only had one record I was allowed to play of hers, but I played that until the grooves were dug right through to the other side. As I grew up, I kind of started segueing on to the Byrds, getting to the hippie side of things for sure. Sweethearts of the Rodeo played a really big role in my love of country. Crosby, Stills, Nash and Young put me onto Neil Young, and then I was in my alt phase of things. Country rock, in other words. And Emmylou [Harris], who became a really massive hero of mine, and still is to this day. Wrecking Ball was out, and I think I remember hearing something of it somewhere. I actually started before I finished school. I was doing high school level — so, A levels in the U.K. — and touring. At the first, I was just saying "yes" to everything, because I was like, "I need to get on board with this stuff while I don't have any bills." What I need to do to be able to come out and say, "By the way, I'm a musician, mommy," is I need to be able to manifest this in something solid that looks like a job. I found a couple kids in my year that were doing DJ/producer stuff. They were like, "Hey, do you want to come and sing?" And I said, "Yes, because I'm saying yes right now." We did a few gigs. They'd bring a singer or an MC and do stuff over their tracks, and maybe they'd have something original that they'd perform as well. What I found was happening was other DJs asked me to stay on: "Would you mind doing another set?" I was just the ultimate kind of MPC sample box ad libber. Then people asked, "Do you want to come and do a track? Because I like how you work live." So we'd start writing and I was just thrust into a room. That's kind of how the electronic scene was in those days, and still kinda is. I've existed outside of that scene whilst being at the very guts of that scene simultaneously for a decade at least. In those early days, you're not getting paid almost anything. You're just trying to make a name for yourself. Sometimes you'll get on this massive tour, and you're doing really well. I was in a group called Bugz In The Attic, and they were on V2 Records at the time. You're being put up and flown around. You go from that level of touring to graveyard shift, local night club kind of thing, when everyone's too high to even know what you're doing. A lot of those cats that I was writing with in those early days turned into people that are now doing pop in the U.K. I became this familiar face, that they were aware of what I delivered. It wasn't where my soul was, and I realized after a while my just saying "yes" was not a tenable scenario. These people weren't my tribe. It was great to work for them for sure, and I had loads of fun, especially one of my first tours. But it was just a completely different genre. They just loved your voice. Yeah. They're amazing people, but I was not being fed. I started delivering more of a top-line job. As a songwriter, you mean. And I realized that what I did enjoy was being able to express myself as a writer broadly. Any random idea that pops into my head I can turn into something tangible—that's exciting to be able to be that free musically. At the same time, I'd managed to start doing something that was a bit Americana, a bit country. You became the front woman in the band Phantom Limb. The way that it worked with that band, if you look at our artwork and you look at our clothes and the way that we were at that time, we looked a little goth-y. I say goth-y — it was more like just rock-y. Everyone's wearing a ltitle too much black. But I wasn't really into all that Mars Volta-y, rock-y stuff. That wasn't really my background. I really liked Americana and roots music. When we get to this [band], there was a hint of it. The guys liked Lynyrd Skynyrd a lot. I was like, "I haven't just gotten through all that [other work] to be one hair's breadth away [from the music I want to make]." [I asked my band mates], "Do you like this and this and this? Yeah? Then why aren't we doing it?" "Because we can't do country. We'll get strung up." I'm like, "If it's any consolation, I think my people have the history of getting strung up. If anyone's gonna get strung up, it's gonna be me. So don't worry about it. I'm the front person. It'll be fine." It took longer than I care to admit to bring them around to the idea. It seemed the second Phantom Limb album shifted toward more of a country-soul sound. Yes. Could you tell my war of attrition was starting to work? You can hear it sonically moving in that direction. But even so, we did two records in eight years. How much longer does a girl have to wait? I found YouTube videos that showed you performing with Massive Attack after that. 2008, 2009 was the main period. I did little bits of writing with them before. Their aesthetic is minimal. It's dub-based stuff, so it's minimal, sparse. Harmony is the opposite of what they're going for. Don't get me wrong: I like a nice, light, cinematic, country, sparse, Raising Sand-esque production. But that's still real lush, really harmonic stuff. So I was like, "This just isn't my plan. It would be easy to get diverted off here, because you could make your money here." So I'm in this scenario where I have to leave this not because it's not going to work, but because it's going to work too well. That would've defined you musically from there on out. Guaranteed I'd be defined by that. It was just ten or so months ago that you finally started pursuing your solo career. In all realism, right up until that point, I didn't have anything in my life that was worth living for. It was just false motivations based on the fact that I can hold a tune, false prophets, false friends — just complete absences of unconditional love and support on so many levels. It dawned on me that I deserved to ask. That was a real genesis of my musical development. You've got to completely change. You've got to take control of your life before you can dare to think that anyone's gonna care what you've got to say. Especially because it was a bold move that you were preparing to make, given how far it was from the electronic and pop credits you'd accumulated. Oh, hell yeah. And I'm a black woman, so I fall into an intersectional quagmire of, "You are a strong black woman." All women are either strong black women or they don't exist. Or if you've managed to fall of the "strong black woman" band wagon, you fall into bats*** cray. So you've got that as an option. I was told, "Don't play guitar; that's stepping on my toes," in a number of old situations that I was in. I started playing, and it dawned on me that if you're just strumming, if you just want to write a song, you can get over that [learning] hump quite quickly. I used to play fiddle as a kid. My bow hand's still got a nice lightness to it, but my fingers have lost all their speed. Was this old time fiddling? It was more English folk that I was playing. I love fiddle. But if you don't play it for a while, you're not gonna get anything. With a guitar, it gives so much freedom, and it asks so little in return. So you could write solo for the first time. For the first time in my whole adult life. In your music, you've made space for introspection and autobiographical storytelling alongside mountain modal melodies, folk inflections and soul-schooled vocal agility. Little bits of things that have been around for a million years. Plus the modern singer-songwriter thing that's really only been in play since the '70s. My [other] influences are before that, so it's like they didn't have the opportunity to cross paths. It's that combined context that gives me this sound. So I say that my influences are old, you know, the Carter Family, Byrds and Staples and Stax and things like that, but it's through the prism of everything since. Along with your ideas about how all of those elements can interact. Yeah. And, I think, things that given the opportunity would've happened. It's just that we still battle so much musical segregation. [What I'm doing] seems wonderfully overdue. If people are saying, "This is fresh," I'm like, "Well, it shouldn't be." [Laughs.] I would've killed to hear this. I am autobiographical because I have to be. It's a bit to do with family troubles and life troubles, but I've just not had a whole load of unconditional support and love in my life. My writing mechanism and my confessional sense is as much to do with wanting to dispel the perpetual "strong black woman" façade that I built through that lack of support into a sense of humanity and of black female emotional breadth. Orphan Offering comes out Nov. 1 on Ear Trumpet Music.